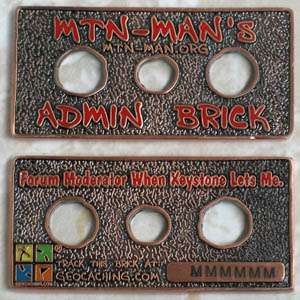 I've not posted here, but second and final version of the admin brick has been out for a couple of weeks. 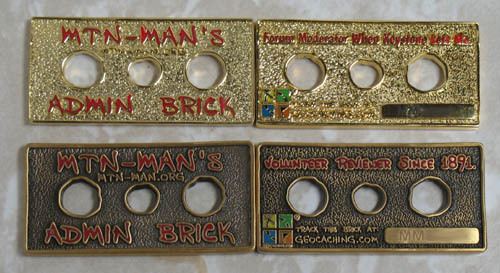 I've seen several posted on one of the auction sites, but you can still buy them for less at the geocoin store. I am also open to trades for the coins as well. Send me an email if you want to trade and we will see what we can come up with. I've got a lot of coins but I'm open to emails. I want to thank you all for the great response to the coins. They really came out very cool looking. I have been very pleased with them. The gold version came out pretty interesting this time. The were shiny! I have a limited number of gold coins and reserve those for special trades. I am going to get the antique version of the gold Moderator coin too.